This is plate 23 of James Baillie Fraser's 'Views of Calcutta and its Environs'. 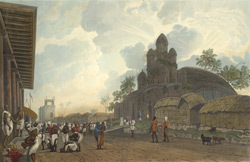 Fraser (1783-1856) arrived in Calcutta in 1814 and in six years produced these animated sketches of the busy city. Moving south into the heart of the city itself, he includes the view of the Black Pagoda in the Chitpore Road, a predominantly native part of Calcutta. This was built in 1731 by Gobindram Mitter, a local zamindar (landlord). It was never completed, and decayed so much that the main tower collapsed around 1813. One of the two subsidiary towers is shown in this image, with the Navaratna, or nine pinnacles.